We all do weird things to our bodies when we're alone: pick our blackheads, clean out our ears for wax, stare at our pores, pick lint out of our belly buttons. And we all notice that when we touch our belly buttons, we get a strange sensation, like we have to go pee. Yeah, there's a reason for that. Dr. Christopher Hollingsworth of NYC Surgical Associates explained to Lad Bible why touching that area makes you feel a bit strange. According to Hollingsworth, touching the belly button stimulates the lining of your stomach, which makes you think you have to go to the bathroom, even though you probably don't really need to go. "At the navel, you have the ability to stimulate not only the skin overlying the navel, but also the fibres of the inner lining of your abdomen," he said. "As you stick your finger into your belly button, it sends a signal from the deeper fibres that line your inner abdominal cavity to your spinal cord." As you stick your finger into your belly button, it sends a signal from the deeper fibres that line your inner abdominal cavity to your spinal cord. He added: "Because your spinal cord at that level is also relaying signals from your bladder and urethra, it feels almost the same. You interpret this as discomfort in your bladder." He also explained why this only happens when you dig deep into the cavity, and not, say, when you push on the skin around your belly button. "You will notice that if you push anywhere around the belly button, it won't give you the same sensation because you aren't hitting the deeper fibres behind the muscle layer. "The internal lining of the abdominal cavity at your umbilicus (belly button) is called your parietal peritoneum. This structure is exquisitely sensitive and its sensory nerve fibres relay input back to the spinal cord at the same level as the nerves that relay sensation from your bladder and urethra." 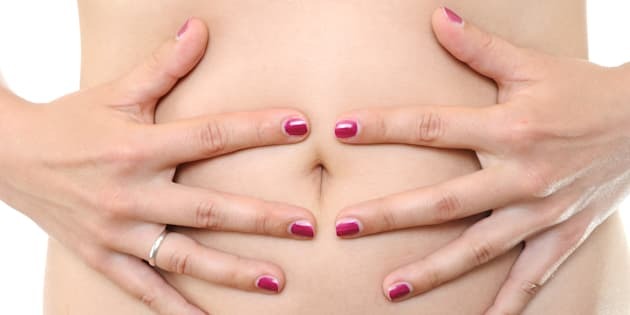 Belly buttons are actually fascinating parts of our bodies, and can tell us a lot about ourselves, including how fast we can run and swim, whether we're pregnant, and whether we have a yeast infection. Belly buttons are also filled with bacteria, with one study reporting that the average one is home to 67 different types of bacteria, while other scientists have found 1,400 different strains of bacteria. And because many of us collect lint in our belly buttons, it's best to give them a good cleaning on the regular by using cotton swabs and a bit of rubbing alcohol to wipe away the dirt.